Our November 2016 report, “Hedge Fund Performance Has Insurers Reducing Exposure,” noted rising investor concerns surrounding the performance of hedge funds and the insurance industry’s exposure to this asset class from 2013-2015. 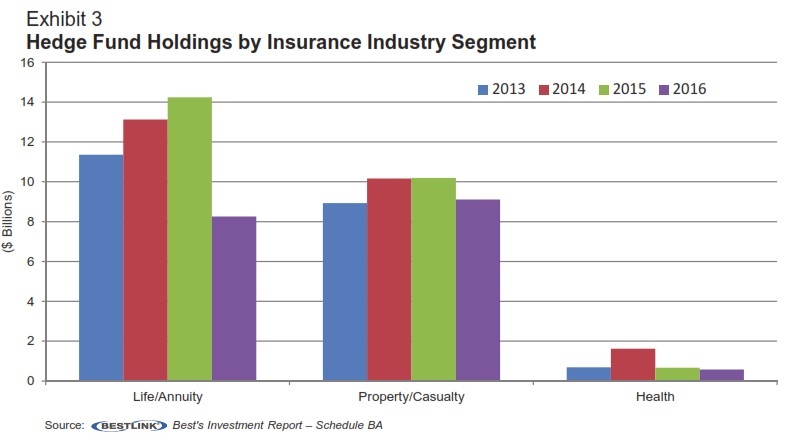 Based on 2016 data from year-end NAIC statutory financial statements, the insurance industry has continued pulling back its investment allocations to hedge funds, declining about 28% year-over-year to just under $18 billion from $25 billion in 2015. As investors pulled out roughly $70 billion across the hedge fund market in 2016, some 1,057 funds closed their doors, exceeding the number of liquidations in 2009, according to Hedge Fund Research. The record was 1,471 closures in 2008. 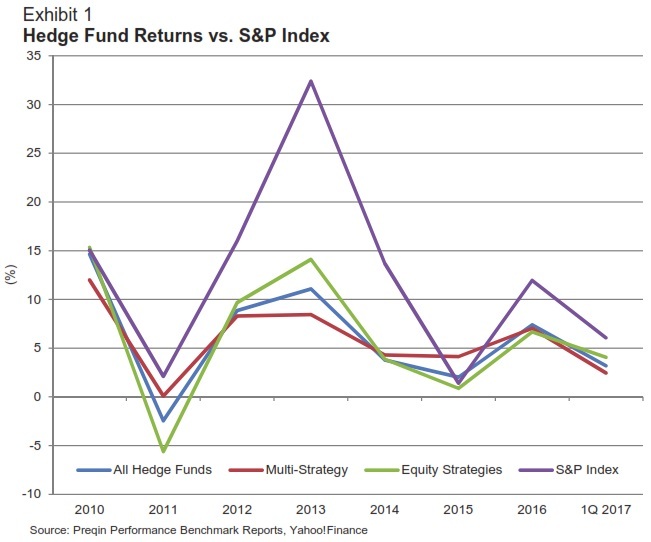 The highly competitive nature of the hedge fund market has led to over-saturation, and many hedge fund managers with less than-stellar performance and operations have had difficulty raising money. Further, investors have grown impatient as managers charge substantial fees for their services for the industry’s below-market returns (Exhibit 1). This has led investors to continue to pull money out at an increasing pace and report five consecutive quarters of net outflows (Exhibit 2). In response, the industry’s fee structure continues to move away from the traditional 2-and-20 model, which charges clients 2% of their assets plus 20% of their returns. Average fees declined again in 2016, with the norm now about 1.3% of assets, compared to 1.6% in 2015, while the fee on returns stayed relatively flat,around 17%. As the industry evolves, these changes in relation to their performance have not been enticing enough to insurers as they made significant shifts away from the asset class in 2016. The shift away from hedge funds by insurers was led by the life/annuity (L/A) sector, which saw a 42% decline from $14.2 billion in 2015 to $8.3 billion in 2016. While not as drastic, the property/casualty (P/C) segment declined just over 10%, from $10.2 billion to $9.1 billion over the same time period while the health segment had total hedge fund holdings remain below $1 billion (Exhibit 3). The pullback by the insurance industry was widespread, as 65% of L/A insurers investing in hedge funds reduced their positions while 60% of P/C organizations pared back their exposure. 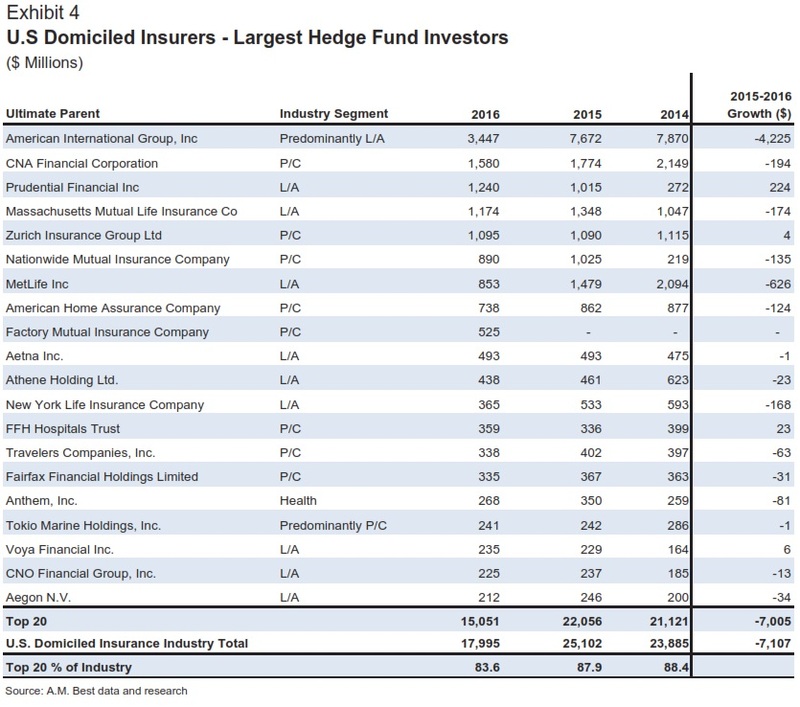 Further, only five of the top twenty insurers investing in hedge funds increased their allocations from 2015 to 2016, one of which was the result of a reclassification of the investments as opposed to strategically investing new money in hedge funds (Exhibit 4). While still maintaining the largest hedge fund portfolio in the insurance industry, American International Group (AIG) pulled more than $4 billion out of hedge fund investments, accounting for more than half of the insurance industry’s reduction. Metlife, Inc. also had a substantial decrease, with more than $600 million flowing out of this asset class. 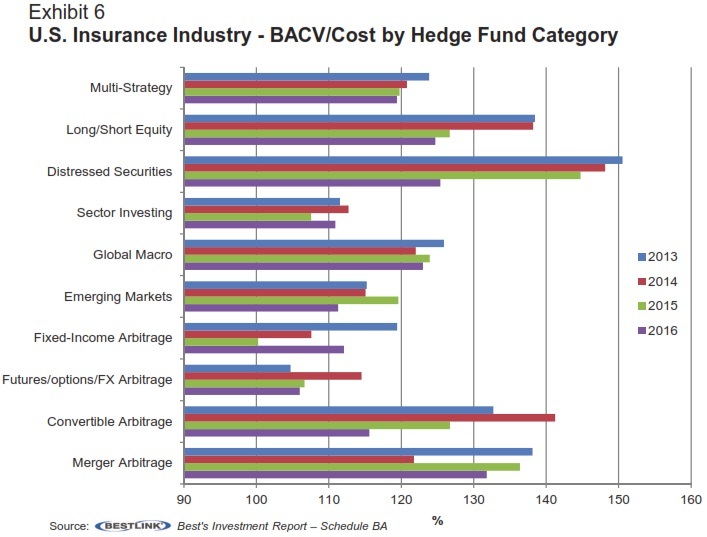 While Schedule BA, which is the investment schedule containing hedge funds as reported by the insurer, is somewhat of a “catch-all” schedule for nontraditional asset classes with less reporting guidance in terms of investment characteristic specifications, it does appear that the large majority of the declining investment holdings in hedge funds is due to strategic investment decisions as opposed to reclassification nuances. investment dollars were the convertible arbitrage and futures/options/FX arbitrage, both of which have minimal allocations. each. Further illustrating the point of recently deteriorating performance of hedge funds, the book adjusted/carrying value (BACV) as a percentage of cost in the insurance industry has been generally declining across the board since 2013 (Exhibit 6). Distressed securities, convertible arbitrage, and long/short equity strategies reported the largest declines since 2013 in terms of BACV/Cost. 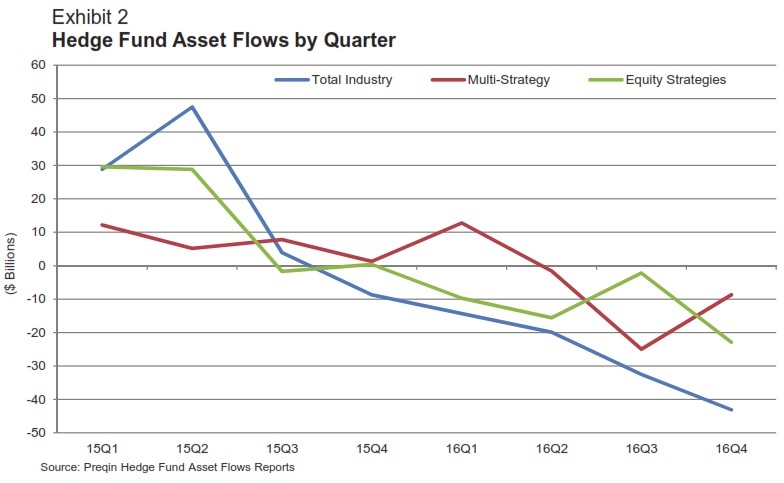 Overall, hedge fund exposure remains minimal as a percentage of capital & surplus for each of the three industry segments. Although the L/A segment still holds the largest exposure, it has declined from 3.7% in 2015 to 2.1% in 2016, attributed to the substantial pullback from companies such as AIG, Metlife, and others. 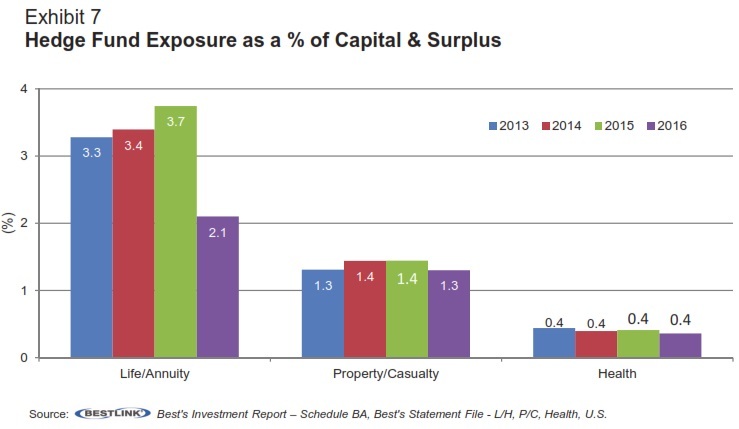 The P/C segment’s exposure as a percentage of policyholder surplus has consistently been less than 1.5% in each of the last four years, while the health segment exposure is minimal. A.M. Best views modest allocations to hedge funds as it would many other traditional asset classes. Our analysts expect companies to be able to discuss these investments in detail, including strategic use, performance, liquidity, and how fair value is measured. This is true whether or not an outside manager is utilized. Similar to any other asset class, there should not be significant concentrations, whether by manager or investment strategy. Most of the alternative asset risk is borne by the higher-rated insurers that have the capital and expertise to better absorb the risk. A.M. Best continues to closely monitor the rising trend in alternative investments and regularly reviews capital charges to ensure appropriate treatment of this asset class. The asset/liability aspect of these securities is also important. Historically, these assets were primarily used as “surplus” investments. More recently, they have been increasingly used in liability portfolios. This use is less attractive from our viewpoint as the potentially higher risk-adjusted return is offset by the often unpredictable cash flows to be used as a cash flow or duration-matched tool. there remain limited attractive alternatives in which to invest in this current low-return environment.